Help can be defined as “To give or provide what is necessary to accomplish a task or satisfy a need; contribute strength or means to; render assistance to; cooperate effectively with; aid; assist. It can also mean “To save; rescue or succour”. When these come from God, it is termed as Divine help. I have come to accept the fact that all humans need help in one way or another in life. Also, those people who usually say, “I don’t need the help of any of anybody”, are usually those who need help the most. The race of life in which we are is very challenging; the fact that no one is sincerely certain of their tomorrow makes the race even more daunting. While it is good and necessary to be hardworking, diligent, studious, etc., the truth is, human efforts are limited. It is only God that is limitless in power, reach, knowledge, etc. He has also promised that He will always help His children and that He will never leave nor forsake us. In Neh. 1:1-11, news came to Nehemiah about the bad state of Jerusalem and the agony of those living in the city. He was so sad and troubled, but he was at the same time helpless. All he could do was to mourn, fast and pray, that God would grant him favour before King Artaxerxes. 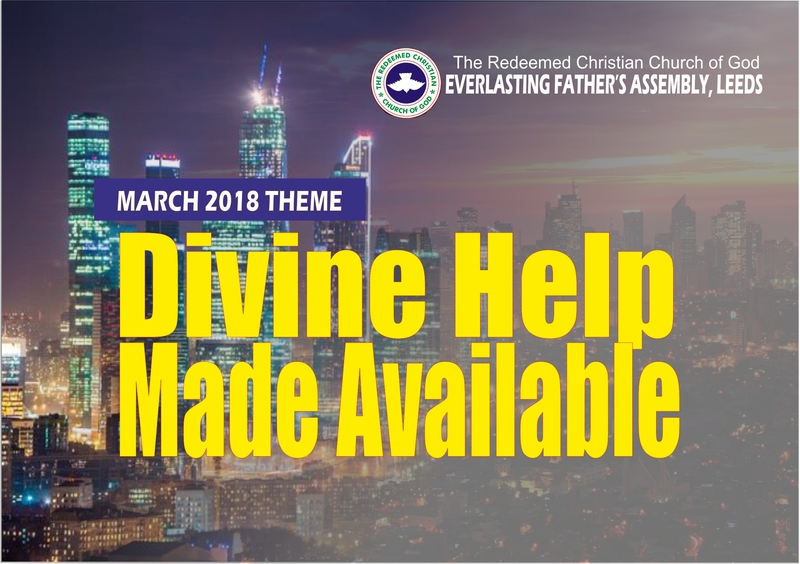 God made help available to him as per his request: God arrested the attention of the king; melt his heart towards Nehemiah; grant Nehemiah the permission to leave his duty post in the palace; allowed him to travel to Jerusalem; command that security and material provision be made available to him for the project; and also kept his position in the palace intact for him at his return (Neh. 2:1-11). God has impressed it upon my heart that He will make specific and crucial help available to us in this month and beyond. Help needed to erect our lives; homes and the entire church will be made available to us by God. May this be evident in our lives and our Assembly in Jesus name.